The aim of this study was to report the prevalence and mortality associated with anticoagulant-related nephropathy (ARN) through a systematic review of the literature. 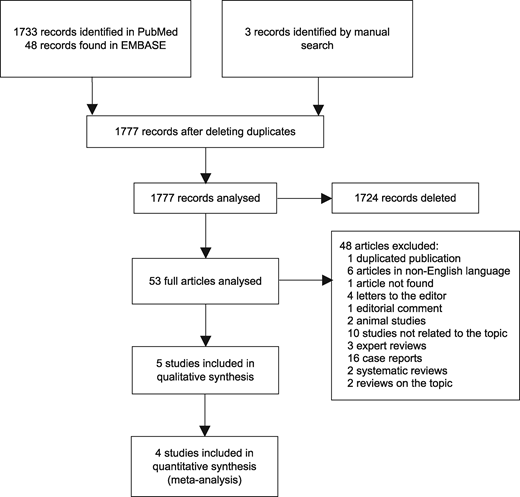 Electronic searches were conducted in the Medline and EMBASE databases, and manual searches were performed in the reference lists of the identified studies. The studies were selected by two independent researchers, first by evaluating the titles and abstracts and then by reading the complete texts of the identified studies. Case series, cross-sectional studies, cohort studies and case–control studies reporting the prevalence and factors associated with ARN were selected. The methodological quality was assessed using the Newcastle–Ottawa scale. Meta-analyses of the prevalence of ARN and 5-year mortality using the random effects model were performed when possible. Heterogeneity was assessed using the I2 statistic. Five studies were included. Prevalence of ARN ranged from 19% to 63% among the four included cohort studies. Meta-analysis of these resulted in high heterogeneity [I2 96%, summary effect 31%; 95% confidence interval (CI) 22–42%]. Subgroup meta-analysis yielded an ARN prevalence of 20% among studies that included patients with fewer comorbidities (I2 12%; 95% CI 19–22%). In a direct comparison, meta-analysis of the 5-year mortality rate between anticoagulated patients who had experienced ARN and anticoagulated patients without ARN, patients with ARN were 91% more likely to die (risk ratio = 1.91; 95% CI 1.22–3; I2 87%). Risk factors for ARN that were reported in the literature included initial excessive anticoagulation, chronic kidney disease, age, diabetes, hypertension, cardiovascular disease and heart failure. ARN studies are scarce and heterogeneous, and present significant methodological limitations. The high prevalence of ARN reported herein suggests that this entity is underdiagnosed in clinical practice. Mortality in patients with ARN seems to be high compared with patients without this condition in observational studies. Oral anticoagulation is widely used for preventing and treating clinical conditions related to thromboembolic phenomena. Although novel oral anticoagulants (NOACs), such as direct thrombin inhibitors and factor Xa inhibitors, do not require regular monitoring of anticoagulation, warfarin remains the most prescribed agent. Anticoagulant-related nephropathy (ARN) is a complication associated with the use of anticoagulants that has been reported in recent years, especially in cases involving warfarin-related nephropathy (WRN). This condition is frequently underdiagnosed and is characterized by the following criteria, which may not occur together: (i) excessive anticoagulation [international normalized ratio (INR) >3 in most studies]; (ii) haematuria; and (iii) acute renal failure (ARF) unexplained by other causes (worsening of baseline creatinine by >0.3 mg/dL). In a case series of patients with ARN, Brodsky et al. [ 1 ] identified characteristic features of ARN in renal biopsies, including acute kidney injury, presence of red blood cells in Bowman’s space and renal tubular obstruction by red blood cell casts. Moreover, the reported rate of ARN is higher in patients affected by chronic kidney disease (CKD) [ 2 ], which might be a risk factor for ARN. This systematic review of ARN in humans was conducted to better characterize the epidemiological aspects, risk factors and associated renal outcomes. The EMBASE and Medline databases were searched for articles on ARN. The searches were conducted with no start date specified and an end date of November 2017, without language restrictions. These records were screened based on the title and abstract, and the full text of the selected records were subsequently evaluated independently by two researchers. Disagreements were resolved by consensus or by arbitration of a third reviewer, either a methodologist or a nephrologist, depending on the nature of the disagreement. Data were extracted by two researchers independently. The complete search strategy is presented in Supplementary data , Appendix S1. The protocol of this systematic review was recorded in PROSPERO (CRD42017081431). Observational studies and case series with five or more participants with data on the rate of ARN and clinical characteristics of patients undergoing anticoagulant therapy by any indication were included. Case reports or case series with four or fewer participants, in vitro studies or animal studies were excluded. The primary outcome to be analysed was the prevalence of ARN. The secondary outcomes evaluated included mortality, progression to end-stage kidney disease, and clinical and socio-demographic characteristics related to the development of ARN. Two researchers assessed the risk of bias in each study independently using the Newcastle–Ottawa scale for cohort studies [ 3 ], in which a maximum score of 9 was possible, and 7 was the threshold for high quality. Single-arm meta-analysis was performed to obtain a summary measure of the observed frequency of ARN in the identified studies. In a direct comparison risk ratio (RR), meta-analysis comparing mortality rates between patients with and without ARN was performed. Heterogeneity was assessed by the I2 statistic, with cut points of 25 and 75% for low, intermediate and high heterogeneity. Moderate to high heterogeneity was explored by subgroup analysis whenever possible. For all meta-analyses, summary frequencies and their 95% confidence intervals (CI) were calculated using the random effects model, and the results are represented in forest plots. The analyses were conducted using the softwares comprehensive meta-analysis version 2 (Biostat, Englewood, NJ, USA) and R revision 3.5.0 (package Meta). Outcomes that were not subjected to meta-analysis because of insufficient data or non-reconcilable differences in the way they were reported between the studies were presented in tabular form. Electronic searches identified 53 unique records. In the end, five studies met the inclusion criteria of this systematic review. The anticoagulant drug evaluated in all five studies was warfarin, and none of the evaluated studies reported NOAC-related nephropathy. The study selection flowchart is shown in Figure 1 . The reasons for not including studies in the full-text evaluation phase are presented in Supplementary data , Appendix S2. PRISMA (Preferred Reporting Items for Systematic Reviews and Meta-Analyses) diagram for the selection of studies included in the systematic review and meta-analysis. The analysed studies were predominantly historical cohorts, except for the study by Brodsky et al. [ 1 ], which is a case series. Most of the studies used supratherapeutic INR (>3) associated with creatinine measurements in distinct time points as an inclusion criterion. Two studies used inclusion criteria that were distinct from those of the other studies, and patients at higher risk of anticoagulation complications were included. The study by Lim and Campbell [ 4 ] included patients with any INR, and the sample consisted of anticoagulated patients admitted to a general care unit for any cause. The study by Brodsky et al. [ 2 ] published in Nephron Clinical Practice also included a sample composed exclusively of chronic renal patients. All included studies excluded patients with end-stage renal disease undergoing renal replacement therapy (RRT). In the included studies, ARN was usually characterized by the appearance of ARF according to the Acute Kidney Injury Network (AKIN) [ 5 ] criteria (worsening of baseline creatinine by 0.3 mg/dL compared with baseline levels) related to a hypercoagulability state (INR >3). The follow-up period ranged from 23 months to 5 years. The characteristics of the included studies are summarized in Table 1 . GFR, glomerular filtration rate; MDRD, Modification of Diet in Renal Disease; eGFR (mL/min/1.73 m2) = 175 × (SCr)−1.154 × (age)−0.203 × 0.742 [if female] × 1.212 [if Black]; NA, not available; CKD-EPI, Chronic Kidney Disease Epidemiology Collaboration; IUC, indwelling urinary catheter; UTI, urinary tract infection; AKIN, Acute Kidney Injury Network. The indication of anticoagulation for the majority of patients studied in different cohorts was atrial fibrillation (AF). Deep venous thrombosis or pulmonary thromboembolism were the second most frequent causes. Other indications were valve replacement, stroke and anti-phospholipid antibody syndrome. The frequency of ARN, defined by criteria of the AKIN guideline, ranged from 19.3% to 63.0% in the five identified cohort studies. All nine cases reported by Brodsky et al. [ 1 ] had the diagnosis of ARN confirmed by biopsy. ARN was more common in patients with pre-existing CKD [ 6–8 ]. The frequencies of comorbidities and of concomitant use of other drugs are described in Table 2 , and the main results of the included studies are shown in Table 3 . ARN, Anticoagulant-related nephropathy; NA, not available; INR, international normalized ratio. Possible risk factors for ARN were reported in all studies. Lim and Campbell [ 4 ] reported that after multivariate analysis, the risk factors were heart failure [odds ratio (OR) = 1.64, 95% CI 1.19–2.25; P = 0.002] and alanine aspartate aminotransferase (AST) at the time of INR >3 with interquartile intervals between 38 and 7002 (OR = 2.29, 95% CI 1.51–3.46; P < 0.001). Brodsky et al. [ 8 ] found that the risk factors were age (63.7 ± 14.7 years in patients with ARN and 61.7 ± 15.6 years in patients without ARN; P = 0.025), diabetes (47% in patients with ARN and 37% in patients without ARN; P < 0.001), hypertension (82% in patients with ARN and 72% in patients without ARN; P < 0.001) and heart failure (62% in patients with ARN and 52% in patients without ARN; P < 0.001). These authors identified similar risk factors in a subsequent study. In a third study, Brodsky et al. [ 2 ] found that excessive anticoagulation in the first 3 months of warfarin use appeared to be a risk factor for ARN (33.3% in patients with ARN and 12.9% in patients without ARN; P = 0.087). Lim and Campbell [ 4 ] used the risk, injury, failure, loss of renal function, end-stage renal disease classification (RIFLE) criteria [ 9 ] and identified the following risk factors for ARN: haematuria (RR = 1.90, 95% CI 1.19–3.01; P = 0.01), urinary infection (RR = 1.68, 95% CI 1.05–2.7; P = 0.03), hypotension (RR = 2.42, 95% CI 1.55–3.78; P = 0.001) and hypovolaemia (RR = 6.04, 95% CI 2.51–14.6; P < 0.001). In this same study, the rapid normalization of the INR with plasma, prothrombinex or vitamin K, but not excessive anticoagulation per se, was associated with an increased risk of ARN (RR = 1.8, 95% CI 1.10–2.92; P = 0.03). For CKD, the only identified risk factor was heart failure on admission (RR = 8.2, 95% CI 1.78–38.1; P = 0.002). There was no correlation between the magnitude of the increase in INR and the risk of ARN in most cases. There were exceptions in the studies by Brodsky et al. [ 7 , 8 ] and An et al. [ 6 ], which reported that INR tended to be higher in patients with ARN. With regard to possible protective factors for ARN, An et al. [ 6 ] identified AF (OR = 0.56, 95% CI 0.4–0.8; P < 0.001) and serum albumin of 3.2–5.3 g/dL. Furthermore, the higher was the albumin level, the lower was the risk of ARN (albumin of 3.2–3.6 g/dL: OR = 0.46, 95% CI 0.31–0.67; P < 0.001; albumin of 3.7–4.0 g/dL: OR = 0.27, 95% CI 0.18–0.27; P < 0.001; and albumin of 4.1–5.3 g/dL: OR = 0.19, 95% CI 0.12–0.30; P < 0.001). Cohort studies with sufficient information were included in the meta-analyses of the outcomes ARN prevalence and mortality among ARN patients. The case series of Brodsky et al. [ 1 ] was not included in the meta-analyses. The prevalence of ARN was estimated at 31% (95% CI 22.0–42.0), with a heterogeneity (I2) of 96%. The meta-analysis of ARN prevalence is presented in Figure 2 . With respect to the causes of the high heterogeneity in the meta-analysis, the inclusion criteria in the studies by Brodsky et al. [ 2 ] and Lim and Campbell [ 4 ] were distinct from those used in the other studies, resulting in the recruitment of patients with more comorbidities. Meta-analysis of subgroup of studies ( Figure 3 ) was performed as a sensitivity analysis and yielded a 20% prevalence of ARN with only 12% heterogeneity between the two studies with comparable inclusion criteria (An 2013 [ 6 ] and Brodsky 2010 [ 8 ]). Random effects model meta-analysis comparing 5-year mortality rates in patients with and without warfarin-related nephropathy (heterogeneity = I2 = 87%). To the best of our knowledge, this is the first systematic review of ARN to date. Although our systematic review has focussed on anticoagulants in general, only studies on warfarin were identified. Thus our results do not apply to anticoagulant agents in general, and we have not found evidence to support or to exclude the association of other coumarin derivates (e.g., acenocumarol) or other newer anticoagulants to nephropathy. Most available studies are case reports, which were not included in the present review. This review selected five cohort studies and one series of nine cases with histopathological analysis of ARN. In the present study, we decided to perform quantitative synthesis of information whenever possible due to the novelty and to the scarcity of information on the subject of ARN. One of the main reasons to perform meta-analysis is to pool results of available studies as a means of reaching a better understanding of clinical phenomena. The prevalence of ARN in the identified studies varied significantly according to the risk of the study population and reached 63% in high-risk patients, including those requiring hospitalization [ 4 ]. However, the best estimate of prevalence in the present study was 20.4%, obtained by the meta-analysis of three representative studies of outpatients undergoing anticoagulation therapy with warfarin using sensitivity analysis that excluded studies on populations with high risk of ARN. With respect to 5-year mortality, although there appears to be an increased risk of death among patients with ARN in the meta-analysis of this outcome’s frequency, the limited number of studies and the lack of direct comparisons between patients with and without ARN prevented us from making definitive conclusions. It is believed that the pathophysiological mechanisms associated with ARN are multifactorial. Macroscopically, the lesions caused by ARN are formed by rupture of the glomerular filtration barrier with consequent haemorrhage of capillaries and Bowman’s space and obstruction of renal tubules by red blood cell casts, resulting in damage to the tubular epithelium [ 1 , 10–12 ]. However, the mechanisms at the cellular and biochemical levels are poorly understood. There is direct damage to tubular epithelial cells by oxidative stress, in which free haemoglobin binds to receptors in tubular cells, dissociates into globin and haem, and activates the formation of reactive oxygen species, lipid peroxidation and pro-inflammatory pathways [ 13–15 ]. Warfarin may inhibit the activation of Gla matrix protein and the growth arrest-specific gene 6, affecting glomerular haemodynamics and the migration of smooth muscle cells, leading to vascular calcification and apoptosis [ 16 ]. Animal model studies suggest that anticoagulants cause direct glomerular damage by inhibiting the activation of vitamin K-dependent proteins such as thrombin, preventing the activation of the proteinase-activated receptor, thereby destabilizing the capillary endothelium and inducing glomerular haemorrhage [ 11 , 17 ]. The present systematic review identified candidate risk factors for ARN in the included studies, including age, diabetes, hypertension, pre-existing CKD, cardiovascular disease and heart failure [ 4 , 7 , 8 ]. In addition, there are factors related to warfarin anticoagulation in other contexts, including excessive anticoagulation at the onset of warfarin use [ 2 , 6 , 7 ], excessive anticoagulation (INR >3) in the presence of hypoalbuminaemia and increased AST after an increase in INR [ 6 ], anticoagulation in patients with underlying glomerulopathies such as immunoglobulin A nephropathy [ 18 ] and thin glomerular basement membrane disease [ 19 ], and genetic polymorphisms such as a variant of the CYP2C9*3 gene associated with increased risk of bleeding [ 20 ]. Despite the rationale for a true association of these possible risk factors with a higher frequency of ARN, the available information is still limited, and there may be confounding bias. All of the possible risk factors for ARN that were reported in the included studies are themselves causes of acute kidney injury, and there was insufficient adjusting for confounding. For instance, there was no adjusting for albuminuria in the assessment of hypoalbuminaemia as a risk factor in the study by An et al. [ 6 ]. Likewise, the report by Lim and Campbell [ 4 ] that rapid normalization of INR was also a risk factor is in itself a confounding factor for a causal relationship. These and other examples weaken the credibility of a potential cause-and-effect relationship to warfarin. Thus, the identification of risk factors for ARN remains an open question. In practical terms, most experts recommend that, in cases of suspicion of ARN, anticoagulants are discontinued (if possible) or their dose is reduced and adjusted for therapeutic levels of the INR. There is no evidence that reversal of an excessive anticoagulation state limits renal injury. However, prolonged periods of supratherapeutic INR can maintain and aggravate tubular damage and glomerular haemorrhage [ 11 ]. Other feasible strategies for decreasing the risk of ARN include antiplatelet therapy suspension and control of arterial hypertension [ 11 ]. With respect to the monitoring of renal function in anticoagulated patients, the guidelines of the European Heart Rhythm Association recommend quarterly monitoring [ 21 ]; however, this interval may be too long to identify ARN because ARN may occur within the first few weeks of drug use. The use of N-acetylcysteine [ 13 ] and corticosteroids [ 22 ] is restricted to an experimental study or a case report, respectively, without clinical evidence of their efficacy. Some experts recommend the monthly monitoring of serum creatinine in the first 3 months of anticoagulation therapy and quarterly monitoring after this period [ 11 ]. In most patients with ARN, serum creatinine levels are maintained or decreased in the first few weeks after correction of coagulopathy [ 1 ]. In cases in which serum creatinine continues to increase or remains elevated above baseline after resolution of coagulopathy, differential diagnosis with another condition should be performed by renal biopsy. Biopsy should also be performed in cases in which haematuria persists or develops after achieving therapeutic INR, suggesting underlying glomerulonephritis [ 18 ] or structural changes in the glomerular basement membrane, including thin glomerular basement membrane disease [ 19 ]. However, it is of note that renal function is not recovered or is only partially recovered in some patients [ 7 ], and patients with CKD are more susceptible in this context [ 2 ]. Some limitations of this systematic review should be addressed: (i) the very high heterogeneity and the lack of sufficient information to permit confounder-adjusted comparative mortality risk meta-analyses precludes the use of the estimated summary effects for practical applications; (ii) the impossibility of performing a meta-analysis of the possible risk factors of ARN; (iii) the impossibility of excluding the occurrence of publication bias because of the small number of studies included and the limited understanding of the nature of this type of bias in systematic reviews of observational studies; and (iv) despite these limitations, we believe that we are providing a valuable contribution to the literature by identifying and organizing, through a systematic review and meta-analysis, a set of currently available studies on a recently described relevant clinical entity. In conclusion, WRN is a real clinical entity with clinical definition and histopathological documentation. The rate of WRN was high in the clinical studies identified in the present systematic review, and this complication seems to be underdiagnosed in care practice. There are no clinical–epidemiological studies on NOAC-related nephropathy, and the presence of this association is unknown. The authors are grateful to the Internal Medicine Service and the Nephrology Service of the Hospital de Clínicas de Porto Alegre for their support. Special thanks to Professor Renato de Borba Mello for suggestions and comments on the manuscript. All authors contributed equally to the present work. All authors have read and approved the manuscript as submitted, are qualified for authorship and take full responsibility for its content.